This week has been typical of any week which has followed a major event over the past few years…..a let down. I live with chronic pain issues and find that nowadays when I have a big event to attend (such as speaking or blog conference….or head shaving/ fundraiser) the week after finds me in bed. This week is no different and to top off the exhaustion I’ve been hit with the stomach flu….thank you so much lowered immune system. Being out of commission has it’s benefits though, not only do I get to spend quality time snuggling in bed with my dog but I’ve had time to engage in some self-reflection. Shaving my head has had a profound effect upon me, it’s given me a deep feeling of FREEDOM. I didn’t quite expect this, I knew on an intellectual level that I’d be stripping myself of a barrier I’d become used to. What I mean is that my hair often spoke about me to strangers before I did. When you choose to sport a “funky” do like I did it leaves an impression….I don’t have that anymore. Now when I’m walking down the aisle in the pharmacy and someone is looking at me it’s not because my awesome hair caught their eye…ok well it could be because I’m bald…..but I feel very exposed. It’s like the left over facade is gone and I’ve been left with my true self. This in itself is freeing. I had thought that I’d covered these issues over the past 2 years or so but I’ve realized that my hair was a sort of a mask for me, one that I didn’t quite recognize. Now that it’s gone I feel wonderful, relaxed and at ease…..stomach flu aside. I’m embracing myself today and hope that you will too……I can clearly see who/what I am and am just simply being that. I’m loving this do! It’s great that something you’ve done for a phenomenal cause has given you an unexpected sense of freedom. Julie, you a strong, strong woman and look radiant in your new glow. Hope you are feeling better, hoping we can meet up before October conferences. Thanks Debbie and thank you for your support!!! Wow, maybe I should shave my head too! Wait a sec. Oh, never mind! 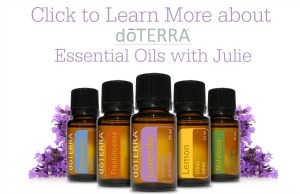 What a wonderful post, Julie! It’s like walking downtown in your fleece pajamas because you really don’t care what anyone thinks and I LOVE that you’re embracing it. In a society that obsesses over appearance, there’s nothing more liberating than taking an action that makes it clear who you are has nothing to do with your hair, your clothes or your perfect makeup. Hurray!! You are just so brave to have done this. I know for a fact that my hair is my security blanket and I am afraid I could just never liberate myself from it. I love how great you look bald though, and the cause you did it for is SO worthy! Sobriety has taught me so much.. so much. Interestingly, I have learned the most in the first year and this year now.. it just keeps getting better!!!!!!! Yup the freedom from people-pleasing has been like dropping handcuffs…. 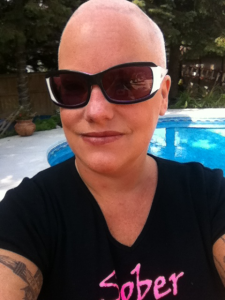 You are an amazing woman and I am loving the bald head and the reason you did it. I hope you are can enjoy more time to relax and get better from the flu. I hope you feel better soon, there is nothing worse then being sick in the summer time. Enjoy your new found freedom, you look amazing! You LOOK FREAKING FANTASTIC!!!!!!!!!!!!!!!!!!!!!!!!!!!! amazing – so proud of you on so many levels!!!!!!! You look beautiful! And think how much money you’ll save not having to dye it for awhile! You are such a strong person for doing this! And you look just stunning! So beautiful! I know exactly how you feel. I shaved my head a few years ago and I felt liberate. I felt more beautiful than I ever have with hair and more confident. There was nothing to hide behind just me on display. One of the hardest things in life (or so I have found) is to be truly comfortable in your own skin.. that, unfortunately, has been my personal cross to bear.. I can only hope one day I can be as comfortable as you with being free being myself! And here I was thinking of hacking my hair off and sporting a bob in an attempt to drop my mask….however you wanna see it though, you are beautiful without the hair. So maybe that’s what people are staring at.